Imagine this is an episode of Jeopardy, I’m the host. You, of course, are the challenger and are leading a hotly contested round by the slimmest of margins. The category is revealed as, “Independent Adventure Games.” “Aha,” you think, “I’ve got it made!” And so you wager all your funds on this one question. Your clue? 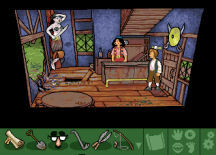 “Released in 2008, this third person, charmingly retro adventure game grew out of a love of the Monkey Island series and a desire to create the kind of games the developers themselves like to play.” If you answered, “What is The Tales of Bingwood?” Congratulations! If not, perhaps it is time to take a few hours and acquaint yourself with Chapter One of this nostalgic offering from BugFactory Games. Though first conceived of in the early 1990s, Bingwood was destined to languish, its story untold, until 2007 when things finally came together (as they do in all good fairytales) and the first of three planned episodes sprang to life. Our hero, Tombrandt Driftwood, the son of the local fisherman, dreams wonderful dreams of the princess of the realm, Liliana. However, even in his imaginings, the romantic lines he means to say somehow come out all wrong. As the game begins, Future Tom visits sleeping Tom. He comes to instruct him (okay, us) in the skills of the Hand, Foot, Eye, and Mouth. In other words, to demonstrate how to maneuver and use inventory (found at the bottom of the screen). As it is entirely point and click, and features the ability to cycle through available icons (by right clicking), these lessons are pretty easily learned. Though it is possible to click through this tutorial, I didn’t find a way to skip it. Tom awakens, realizes he is late (for what, we are not told) and runs out to find the Royal Messenger proclaiming to the gathered villagers that Princess Liliana has been abducted by the Evil Wizard, and on the wedding anniversary of their Royal Majesties, to boot. Someone must rescue her, and that brave soul will receive the hand of the fair princess in marriage and half of the kingdom as a reward. Arnold Smith, the square-jawed blacksmith -- reminiscent of another Arnold in look and voice -- cannot help because he has to fulfill a pressing order for one thousand horseshoes. As he is a perfectionist (the horseshoe after the next one he finishes will be his third), he is out of the running. Angus, our shopkeeper, would be most glad to rescue her. But first he must finish his inventory, and this can’t be done until he can find the missing key to the storage shed. Lommy Turnip, the jovial miller, would gladly save the day but he has much “milling around” to do, and Miss Welt, former pirate queen turned innkeeper cannot leave her guests unattended. Luckily, the absent-minded Sage recognizes a champion when he sees one, however unlikely in appearance, and volunteers young Tom for the job. Tom sets off through a 2D intentionally pixelated world of rustic houses, shops, farms, castles and even a nefarious shady woodland. To rescue Princess Liliana, his quixotic journey will require him to solve mainly (but not always) logical inventory challenges and to interact with amusingly quirky characters. He will not have to conquer any mini-games, sliders, mazes, sound or color dependent puzzles, or timed or action bits. As it is intended to be a game reminiscent of early classic adventures, Bingwood sports a less detailed look than do current games. One sees blocks of color as opposed to gradations, and only the strongest of emotions are reflected in the characters’ faces. Though most items were identifiable, occasionally I had to rely on the auto text for that “aha” moment. For example, there was a section of differently colored graphics in Tom’s house, but it wasn’t until I moused over it that I realized it was a rain coat. This never really caused a problem, though. And on the plus side, I never had to pixel hunt. Each non-player character (NPC) was caught and really brought to life by the professional voice acting. I enjoyed it across the board with a couple of caveats. Often, it paused inappropriately in mid-sentence, waiting for a click to continue. So a sentence might sound like: “I think I will go to town………. (click here)…………..and talk to the smith.” Also, at times, some NPCs’ mouths had a disturbing tendency to continue moving for a second or so after their speech ended. The background music is peppy and upbeat, and ambient sounds such as footsteps and birdsong added to my enjoyment. However, if that isn’t true for you, the voice, music, and sound effects are all independently adjustable from the settings menu. Tom interacts with the major players in town, and the dialogue is frequently humorous. I can’t say that I laughed hard enough to fall from my chair, but I did giggle often and found the conversations and comments funny more often than not. The dialogue, too, can be clicked through quickly. As Tom will be doing a lot of running around, I was very glad when I received my map. It does not offer an instant change of scenery, but it does allow you to move to all the available locations more quickly than by walking. Bingwood is Alt+Tab friendly and you can save at will. However, you are limited to four save slots. Since you cannot die, that is enough but I am always aggravated when my ability to save is limited. The game was mostly stable, but I experienced some problems with the save system. First, late in the game I tried to save so I could exit and finish the game the next morning, but the game would not allow it. That forced me to continue playing through to the end. Obviously, I would have rather saved and concluded the game in a time of my choosing, not the game’s. Also, when beginning this review, I started a new profile in the game in order to verify something near the game’s beginning. When I switched back to my original profile name, all my saved games had vanished. In spite of my save problems, I enjoyed Chapter One of The Tales of Bingwood very much. Though the gameplay was only a few hours (maybe five, but some will play it much faster/slower) it amused and entertained me, and I hope that the developers will be able to make Chapters Two and Three so I can find out how this delightfully off-beat fairy tale ends. 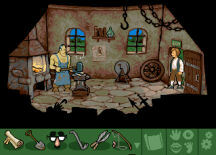 If you wish to cavort around Bingwood with Tom, you can try the demo or download the game from the BugFactory website.